In this market, you don’t have time to wait a few days or until the weekend to view a home. If you find a home that interests you, I will immediately spring into action, do my preliminary research, and make arrangements to show you the home as soon as possible. I don’t say that with arrogance; I say that with passion and excitement over the results that I’m able to achieve for my clients. I exercise my negotiation muscles daily in my career and with the two small children that live in my home and call me “mom.” Part of my negotiation successes are due to my diligence in assessing the seller’s situation. I have become a master conversationalist with listing agents to find out what the seller’s needs are so that we can handcraft our offer to win out all the others. even if it’s the brutal truth. I want my buyer’s to live long happy wonderful lives in their homes and I don’t take that responsibility lightly. If you enjoy a quiet peaceful backyard and want to see a house that backs a busy road, I’m going to point that out as a potential drawback. If you are fearful of remodeling, then perhaps we should skip the house that has the original kitchen from 1970. If you like to spend your weekends adventuring and suffer from intense seasonal allergies, the 1/4 acre lot with abundant landscaping might not be the right fit for you. Large lots often require lots of time maintaining… and lots of sneezes for allergy sufferers. My valuable insight and experience will hopefully save you from regrets later. 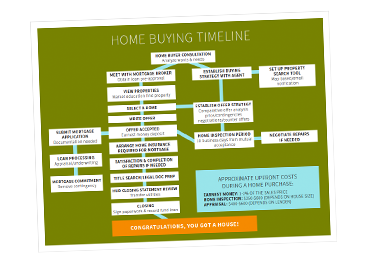 No one comes out of the womb knowing how to buy a home (yet!) and it can be a tricky proposition if you’re not guided by a trusty professional like myself. That’s why I created this fancy flow chart to show you exactly how this works. But don’t worry. Once you work with me, we’ll go over it in much finer detail so you’ll be up to speed in no time!